One hundred yards down the lane where I live in a corner of northwest Ireland, in the first village on the River Shannon, is a holy well. For many years the ivy worked away at the mortar; stones were perilously loose. One wall looked at risk of collapse. The well had a reputation for having ‘gone dry’, meaning that you could no longer draw the healing water. In that circumstance the cure – the healing power of the well’s spring water – flees to the nearest tree. In this case the tree was covered in ivy and also didn’t look in the pink of health. Nevertheless, the holy well was a focus for local devotion and I witnessed various neighbours trekking up to Tubber. Clooties appeared on that tree, offerings for the cure or in gratitude for favours granted. It also fulfils a memorial purpose as people adjust to bereavement. A funeral card and candle are fixed within a niche inside the well. A whisky bottle was left. Various coins from around the world were left on the stone lintel. A cracked image of Mary was put there after a friend’s son died from cystic fibrosis. A teddy bear is tied to a tree limb, placed there during the anxious wait on approval for my neighbour’s daughter to adopt two Russian siblings. Even in our most secret longings and prayers in this small community we can apprehend what it written in each other’s heart and mind. The townland where this well is located is called Tubber, an anglicizing of the Irish tobár, meaning well. The full townland name is Tobár Mhuire – Mary’s Well, dedicated to Our Lady who in local legend is said to have appeared here centuries ago. My late neighbour Delia Hamilton, who died six months shy of her centenary, said it was long before even her grandmother’s time. Holy wells are fairly two a penny in this part of northwest Ireland. The limestone geology of West Cavan, Leitrim and south Fermanagh creates many underground caves and rivers; the springs that feed holy wells rise from the depths of the limestone and sedimentary rock laid down after the Ice Age. The Shannon River actually originates underground in Co. Fermanagh on Cuilcagh Mountain before rising above at Shannon Pot. This is a watery landscape of rivers, the Erne and Shannon and their tributaries that made this area a hive of monastic activity in the middle ages when they were the offered safe and fast transport. There are also hundreds of loughs and even turloughs – lakes that seasonally appear and disappear. The geology is also responsible for the many springs that feed the holy wells, each local well with its own deity and now saint. Before St. Patrick came with a particular intent to Christianise this region there was a huge cult to Crom Cruich, a god obscured by Christian propaganda and a lack of pre-Christian written history to enlighten us on his exact nature and focus for worship. Local historians have traced a network of Crom Cruich sites that seem to be connected with holy wells that are roughly a country mile from one another. This chimes with one speculation that Crom was an underworld god, similar to Pluto in the Greek pantheon. 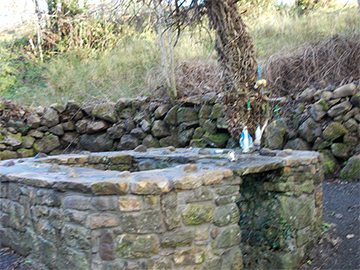 Nowadays the wells are often dedicated to Our Lady, a throwback to the Goddess to my mind. Or they are dedicated to saints- well known Irish heroes and heroines like Patrick and Brigid. The holy well that was such a stronghold of the Crom Cruich cult is now dedicated to St. Patrick. This was because Ireland’s chief missionary came in particular to convert this region. His holy well is in Belcoo, Fermanagh. Across Lough MacNean is Kiltubrid – roughly translating as ‘the church and well of Brigid’ who is said to have founded a monastery at Killinagh in a belts and braces manoeuvre to make sure that converts didn’t backslide. There are wells with cures dedicated to lesser known local Celtic saints like Mogue, Aodh, Lasair and Ronan; most seem to have had some local connection through birth or family clan. St. Patrick’s well has a cure for ‘nervous ailments’. In modern terms this means depression and local gossip says that there is a regular collection of litres of holy well water by someone travelling from Belfast. St. Lasair would have the cure for the stomach. The clay from Mogue’s Island at Templeport protects you from fire and accident. Brigid wells would have the cure vision problems. My local holy well still has fertility associations. In October 2001 an exploratory well for shale gas was drilled in the townland of Gub, Dowra. Along with limestone we also have shale and other wonderful rocks left here from the Ice Age, unique bio-systems, natural and built heritages. It’s why the West Cavan- South Fermanagh region was granted Global Geopark status by UNESCO in 2008. Dowra 1 and Dowra 2 were the advance party of fracking companies like Tamboran who want to use the controversial hydraulic fracturing method to extract natural gas. They hit ground water one mile down. This land of peat bog and limestone is indeed watery. Dowra is at the head of Lough Allen and this area is known to geologists as the Lough Allen Natural Gas Field. As of April every single county in Northern Ireland, along with Cavan, Leitrim, Sligo, Donegal, Roscommon, Mayo, and Clare in the Republic of Ireland have had applications for licenses to explore for shale gas. The chemicals injected into water during the fracking process have caused considerable pollution problems elsewhere in the world and in terrain that is far less water logged than Ireland. The first human epidemiological study of the effects of living in a frack zone began last year in Pennsylvania through Geisinger Medical Centre and Susquehanna Health. There is a fear for farm animals with agriculture being the economic mainstay of the region, not to mention the entire country, “Farming Not Fracking” is a familiar antifractivist slogan in Ireland. And what will this ‘fracturing’ of the rock do in limestone regions, in earth already with naturally occurring hollows? I think of a grandmother with hollowed out osteoporotic bones having compression fractures with her skeleton gradually crumbling. Earthquakes have been reported worldwide and the US state of Arkansas banned fracking after a series of earthquake tremors that did not settle until six months after the moratorium. What will the chemical mix injected into earth – with groundwater close to the surface in this region – do to the water of our holy wells? How will it affect our traditions, the cure, and the sanctity of the well? If the water is ‘bad’ people won’t want go to the well? Some think that what makes somewhere sacred is the reverence, prayer and devotion that is poured into a place. In summer 2010 Leitrim and West Cavan residents began to mobilise to fend off the natural gas land grab. Meanwhile, our neighbours just ten miles over the border in Northern Ireland are deeply vulnerable. The debate in Northern Ireland has divided roughly down sectarian lines since Sinn Fein was, and remains, the only political party in Ireland who states as policy a complete ban on fracking in Ireland. With the Good Friday Peace Agreement only fifteen years old and peace work still ongoing to recover from the Thirty Year’s War in Northern Ireland there is still a considerable risk that old troubles will re-emerge. Last summer Eddie Fitz figured out that Tobár Mhuire was actually on land he owned; therefore, this conferred upon him the role of the hereditary well keeper. Our neighbour took this responsibility seriously and over a year the well was completely renovated. The stones were replaced with donations from his field above the well and were securely mortared in by a local mason. The foot deep of leaf mould that choked the well head was cleared and is now routinely maintained. The well was never dry at all. It had silted up with falling leaves. Last Feast of the Assumption, 15th August, despite heavy rains earlier in the day, clouds cleared and an open air mass rededicating the well was said with over a hundred locals in attendance. The priest blessed the well. While you might wonder why he would bless what is already sanctified his homily made the reason clear. Holy wells in this part of Ireland were associated with Lunasa, the pagan harvest festival at the end of July and early August. The fairs remained a tradition into Christian times and were by many accounts rough and rowdy. Fist fighting brawls are all part of the fun. Apparently at some revelry in the 19th century a fight got out of hand and blood was spilt into the holy well at Tubber. It seems that there was some local feeling that this somehow polluted the well, which may account for why it fell into such disrepair. Then in the 1870s a huge flood nearly wiped out Tubber, until then the main population locus in the area. Only five houses remained from a townland that had many shops, smithy, three taverns and fifty households. After this flood the village of Dowra was founded at a natural ford of the River Shannon, becoming the main village in the area. While devotion at the holy well never completely died out, there seemed to be a sense of ‘taint’ or sadness associated with the well. Ireland is a long memoried land; it is completely feasible that the families involved in the fight and their descendants shunned the well. It would have felt as if there was ‘no luck’ in it for them. As we in this region contemplate what fracking could do to our lives and livelihoods, homemade posters of our region’s holy wells began to appear. Tobár Mhuire has been repaired and rededicated. There are Facebook groups celebrating the holy wells of Ireland. spring from the invisible underworld. They retain respect, reverence and fascination. It’s as if there is an atavism in the human psyche about the tradition that surrounds holy wells and Ireland has kept it alive as a spiritual tradition. The memory will not completely go away. In other places you find wishing wells. People put up plaster moulds of them in their front gardens just as others put plaster gnomes to represent earth spirits. We have ‘wishing wells’ where we toss coins. The clootie trees, with their rags, rosary bead, ribbons and scapulars, are also known as wishing trees. Rather than strictly being a ‘wish’ the life’s water springing from the unseen otherworld was considered blessed. A ‘cure’ might also be a cognate to a wish. Fracking could poison the springs that feed our holy wells and pollute them irreparably. Most people drink the water for the cure. Pollution threatens the folk cures that many people still use today. Fracking may not be a blood spilling but it does violence to the earth and could forever rob the sanctity of the holy wells of our region. Northern Ireland is particularly ‘at risk’; given the geology of the region it will ‘spill over’ into the Republic of Ireland. Because we are a single island with two national governments we have to campaign cross border and on two fronts. We who live on the Republic’s side of the border know that we will share in the water, air and noise pollution. This region, with the cleanest air in Western Europe will be compromised. mortar loosened by the gnarling ivy. fallen leaves striking dumb the mouth. down there, a foot below leaf mould. all a wish, a word, a prayer. Even as the stone wall falls. What is broken wants mending. What is hurt wants wishing well. not a part, nor yet apart. stones witnessing the wish to be well again. This too is part of the cure. For there is nothing new. This pain is ancient and yet it rains still. Leaves swirl down into the well. soupcon by the lightest of hands. Sun spreads a golden syrup down the hillside. summerday blue and half-mourning grey. Bee Smith lives in the cross-border region of the Marble Arch Caves Global Geopark in an area that extends from Butler’s Bridge in Cavan to Castle Archdale in Fermanagh. Born in the USA I lived for twenty years in England before moving with my partner and companion animals to Dowra, the first village on the River Shannon, in September 2001. 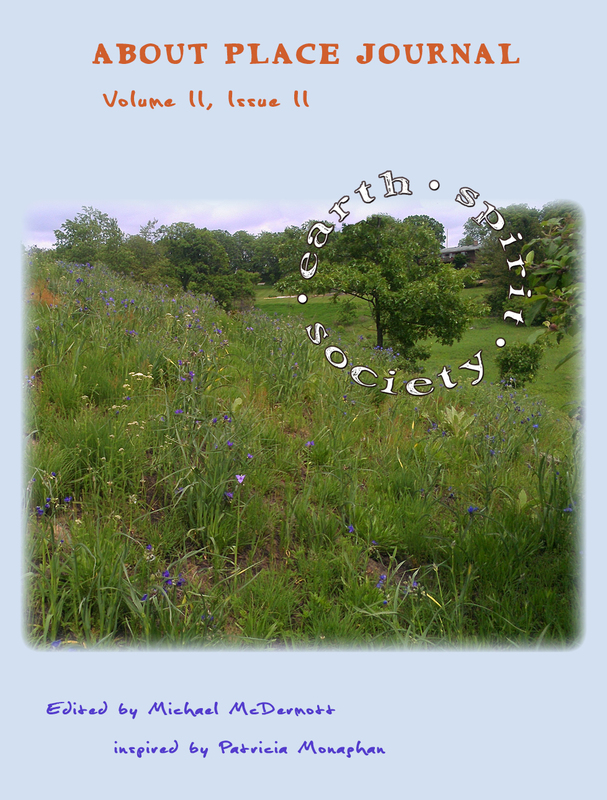 Poetry has been published in journals in the UK, USA and Ireland. Her haiku is included in the first anthology of Irish haiku, Bamboo Dreams. Patricia Monaghan instigated what became Irish Blessings Tours (www.irishblessingstours.com) where I lead Brigit pilgrimages and walking tours in West Cavan, Leitrim, Fermanagh and Sligo. 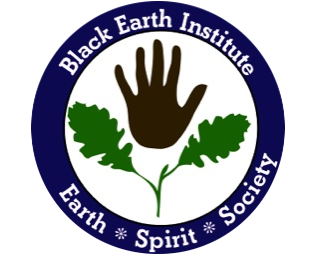 A Brigit tour in 2014 will have the international gathering at Brigit’s Garden in Galway as its main focus.